This looks like a scene from the magical mystery tour, rather than (modern) transportation! Very cool. I love the rich colors here.. Nice capture! The colors and light in this are so beautiful. Wow – that\'s some taxi alright! And a really beautiful photo – I also love those bright colours. The composition of the matching colors, makes this one pop!! once again I love the unforgiving Tibetan sun and the colors it produces .. really wondering how long you compose these great shots. the winding road, the distant mountain the nearby building and the taxi itself in perfect harmony! BRAVO!!! The story behind "Tibetan taxi in Xigar"
This friendly guy stayed around for a picture, after he dropped us off. 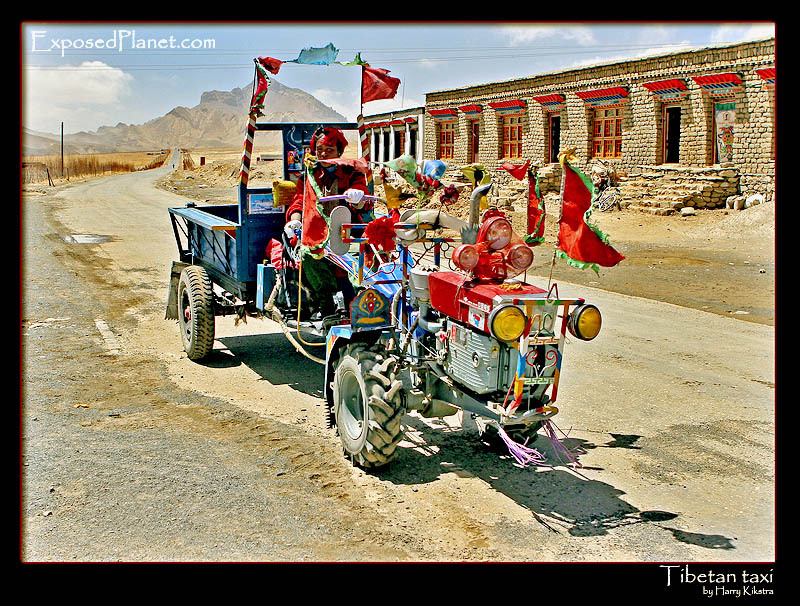 We hitched a ride with him and his interesting machine to escape the dusty winds of the Tibetan plateau, where it can be hot and cold at the same time.